This item (V61882) is not currently available for purchase. Create amazing light displays in seconds with new and innovative Christmas laser lights! With just the push of a button you can transform a woodline or garden area into an enchanting display. Laser lights stake right into the ground and with a 72 inch lead wire, installation is a breeze. Use the remote to control the motion and light display speed, turn the lasers on and off, switch colors and set the timer! Many fascinating displays can be created by alternating between red, green or combining both! With so little work you can create a majestic wonderland year after year in minutes. These are amazing and much better than any other projectors on the market. Highly recommend them. I have to showcase a large cedar tree in my yard. I am using 2 lasers to light up front of tree. It is really beautiful, mesmerizing to watch and safer than trying to string lights. Love it!! This one is the best I've ever come across! Love it! Would like it even more if there were color choices available. Easy way to decorate for Christmas. We set ours on a timer. Our neighbor has 3 of these lights and we were very impressed with the display. We will set ours up next Christmas, and we know we will be very pleased with this purchase. The only reason I didn't give this product 5 stars is that I had bought two of them in 2016 the red light in one did not work for the 2017 season. There are no replacement lens available, so you have to buy an entirely new unit if there is an issue. I did buy a replacement right after Christmas because I like them so much for their ease of setup and the bright illumination. The laser lights has the right brightness, but the remote is not working consistently. The weather in Michigan is cold and it is not fun to have to go outside to turn the laser on and off. I contacted Customer Service and they sent me a new remote right away. Best laser light I've bought. The X1000 red/green laser is great fun and looks spectacular. It covers a very wide area when projecting horizontally. I'm currently using it under group of trees, projecting vertically; I now have magical trees in my yard. The effects are enchanting. Highly recommended if you have enough area to cover so that it doesn't bother the neighbors by illuminating their yard too. Very good product, but you do not include a extendable stake for people who live in the Northeast and have to deal with occasional snowstorms. Excellent! Set up is easy, the lights are bright and the unit appears very sturdy. I ordered other brands and sent them all back. I will be ordering more of these! Good quality. Nice, wide pattern. We like the adjustable speed. The remote has a short range and needs some work. We love the laser lights. Ours work perfectly!! Reviewed by J. Steven Y. This light projector is a wonderful addition to my house display. A real quality item. I am impressed. Gave a great red and green display as expected. Product could be improved with built in light sensor, but the timer does the trick. Easy installation made Christmas decorating outside a breeze! Two units can cover the front of a 1,600 square foot ranch. Bought one, then another after seeing its bedazzling display. Since shining it on my oak tree a week ago, my neighbor and two friends purchased one. Very high quality. As a child, I would stare at my lighted Christmas tree in wonder. Now, I have recaptured that same feeling with my outdoor tree lit up with lasers. This product is very well made and projects a very nice light show on our house/garage. The red laser is dimmer than the green but together they show up nicely. I have added two more to my collection, making my total six. Need i say more? Overall, the laser projector is well constructed and has a vivid display. However, you have to reset your display settings every night for the effect you want. Awesome product. Very bright and the color is beautiful. The neighbors are amazed at our laser light show. People are stopping in front of the house to check it out! I bought one for my son and two for me. We are both very pleased. An excellent addition to our outdoor Christmas lighting. We love this product!!!! The red/green light combination in motion looks great. Great product! Way better made than the star shower. Love this light. Looks beautiful on my house and evergreens. Loved it so much that I ordered a second one. Only problem I have had is that the remote will not turn off the lights from any distance further than 5 feet. Will turn them on from about 30-40 feet away, but will not turn them off. Have already spoken with the company and they are supposed to call me back about this issue. The light itself is brighter than others, however, the fact that the timer to shut it off each night after 6 hours to increase the life of the product is concerning to me. I set up the light projector last night and it was awesome.Great Projector!!!! We've only had the lights for a few days but are very happy with the results! Very easy set up. Love the look of the twinkling lights. A touch of magic. X1000 Green/Red Laser Light is Spectacular! I bought two. They both look great. However, one does not respond to the remote, so I cannot "freeze" the lights nor change the speed. The laser light itself is awesome; it shines very bright across our ranch house. On the other hand, the remote is a worthless piece of junk. I changed the batteries and still have to get within a few feet of the laser to turn it on. Green/Red Laser Light - Best Laser! I bought this laser light after seeing what an awesome job it did lighting up a friends yard. I am thrilled with my light! It covers the entire front of my house and you can see it from the road. This light is far superior than one I tried last year. I love the auto timer on the remote. I bought this laser light after seeing what an awesome job it did lighting up a friend's yard. I am thrilled with my light! It covers the entire front of my house and you can see it from the road. This light is far superior than one I tried last year. I love the auto timer on the remote. My laser arrived promptly. I was quite pleased with the sturdiness, it's not cheap plastic like many are. I plugged it in and the entire room floor to ceiling plus part of another room was aglow. At night I lit a 50 ft. pine tree plus another tree. Now I will have to wait for Christmas and extended use for the full evaluation. I have very good vibes about it. Projector is very easy to set up and use. Great projection, however green color appears more dominant than red using dual colors. Wonderful product and I highly recommend this product. Super fast shipping. So cool! We think it will eliminate the need to put up lights. This product is well made and seems to be very sturdy. I turned on for a short time when I received it and the motion lights were great. I can't wait until Christmas to display it! I have only used this laser light once, but it seems to be a nice product for the price. I would have given this 5 stars if the motion of the lights were a bit slower. I am a long time customer. If I ever had a problem with the product I was always taken care of in a quick manner. I received the Laser Christmas Light Projector in the middle of a 8 day 90+ degree heat wave in July. I set then up in the middle of the heat wave to check them out and was very please with the workmanship of the product and how bright the laser at 25 feet from my home. I will be buying 4 more 2 for my sisters house and 2 for my next door neighbor who came over to see what was going on when I was setting them up for the trial run. Great product and great service! Received and it doesn't work. The device works great; however, to use the remote, you must be very close to the projector. I bought these after Christmas, and I can't wait to use them next year. We tried them out, and when we turned them on everyone got so excited and happy. They are so cool. I bought this product after Christmas so I don't know how it will look outside. I did put it on in the house and I am impressed. I'm sure it'll look awesome outside. You do need to be close to the actually unit for the remote to work. The unit itself feels very durable as it's made of all metal so it should last. A quality product with solid construction. The lights are bright, and the motion capability really adds an interesting touch over a simple static display. You won't be disappointed. The green and red were well balanced, and the contrast with darker areas make the lights appear even brighter. I didn't get to use it very long this Christmas, but I did try it and it looks great. I absolutely LOVE this product! The ordering and shipping were fast and the product well made! The neighbors and I were fascinated with the lights that looked like fireflies in the tips of the tall trees. The remote is great so that you can decide what speed you want the lights to move (or even keep them still) as well as being able to put the lights on a timer. A little pricey but worth it! This is an excellent product and REALLY can project laser effects 300+ feet. We use it to light up our whole back yard! Highly recommend! 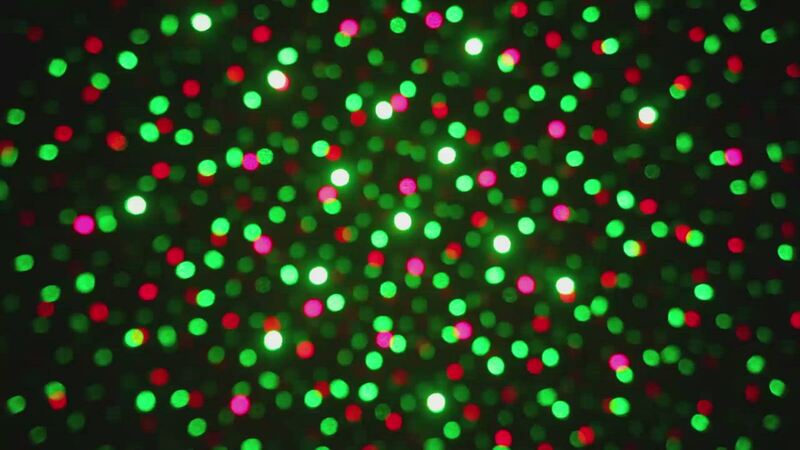 X1000 Red/Green Laser - Best Lights! Looks great! I bought one, and it looked so good I bought another!!! In my opinion the best laser light on the internet. Bright and colorful, and the beam encompasses the whole house. All made of heavy metal (not plastic!!) - worth the price. Super customer service. Thanks - will buy additional for the back yard. We were so impressed with the projector we have ordered another one. I couldn't be more pleased. The display is many times brighter than similar products we have seen locally, and the movement not only swirls the light points, but forms changing patterns. The heavy metal projector is very substantial and hopefully will last us many years. Im very pleased with the Christmas light. It really brings out the house and trees, it beautiful. Great laser, very bright. Just wish the laser covered more area. I ordered two laser lights, one of the lasers arrived broken. The laser did not work right out of box. Not good, considering the high cost. Excellent product. Makes it very easy and convenient to set up Christmas lights for your home. The lights are more spectacular looking if there are minimal to no surrounding lights (I.e. Street lamps, moonlight, other house lights), but even with those surrounding lights it looks great and is a nice and convenient alternative to setting up strings of lights. Great quality. SO easy and quick to setup. Thank you!! We are so happy with our purchase that we may buy more for the side of our house. Everyone who walks by comments on how cool they look. I purchased the red/green laser light projector 1000 with motion and highly recommend it! We have received so many compliments! The light show is soothing and beautiful ! We have amazed our neighborhood with these lights. I was skeptical at first, but my husband was wanting to get away from stringing all the Christmas lights. I researched all the products out there and this one had the best reviews! There is a reason....it is the best! It makes your house dance and your trees sparkle and it covers a huge area! We have a 3 story house and I was worried I would need to buy two, but one is perfect! We are thinking we may use it by the pool this summer at night. Greatest buy this Christmas season! Easy to set up; creates a terrific twinkling effect unlike cheaper products that just project static dots of light. The one shortcoming is that, because of the physics involved, the red laser should have greater power than the green so that the visual effects are equal. At least this is no surprise because the product description mentions "Super bright green laser light." The product is of high quality and the lasers are super bright. Bright lights that move are cool! All metal design. I love how bright the lights are and how they move. Definitely worth the money to buy quality in this case. perfect for the season...I am so pleased!